If you want to access Firefox about:config preferences directly, you can do so to speed up the editing of preferences, or bookmark them. 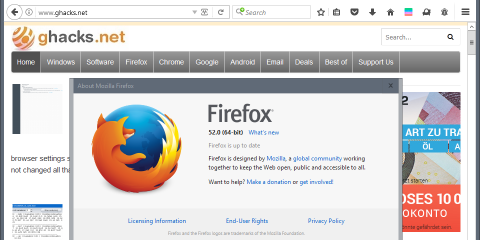 Firefox’s about:config feature, and the underlying structure that powers it, is a mighty feature that is more powerful than that of any other browser out there. While Chrome or Edge come with their own experimental flags section, these pale when compared to what Firefox users have access to. The usual method of editing these preferences is to load about:config, type the name of the preference that you want to edit, and start editing it once it is listed. If you have used Chrome, or a Chromium-based browser, you may know that you can jump directly to any of the experimental preferences that browser ships with. You see an example of that on the screenshot above. The URL about:config?filter=layout.css.servo.enabled takes you directly to the preference. It is a shortcut to opening about:config and entering the preference name manually in the search field at the top of the page. What is interesting about this is that you can type partial preference names as well, e.g. about:config?filter=sync to list any preference that matches the term in its name or value. This filter parameter servers two purposes. First, it lets you get quickly to any preference. That is great, but it may not save you a lot of time if you have to type it manually. It may be useful if you use partial preference names though. The second option however is super useful. You can bookmark these preference links to access them quicker. This is super useful if you change a preference regularly, e.g. toggling something on or off depending on what you do in Firefox. The idea to use the filter parameter to bookmark about:config preference listings is what appeals the most to me when it comes to it. Quick jumping is nice, but I’d guess you are probably equally fast if you open about:config manually and type part of the preference’s name in the search field. Now You: Have a lesser known browser tip of your own? Lets hear it in the comments below. The post Access Firefox about:config preferences directly appeared first on gHacks Technology News.